Straight from our door to yours. At Knight Dairy, we pride ourselves on the following key strengths. 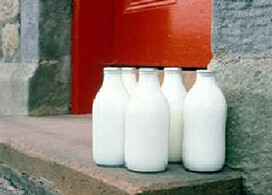 At Knight Dairy we we are able to offer milk in glass bottles which are fully recyclable and better for the environment. We are able to handle commercial orders for businesses such as offices, factories, shops, restaurants, schools and other work places within Rotherham & Sheffield. As well as the businesses we serve, we have been delivering milk in glass bottles to residential doorsteps for all of our 15 years and our traditional friendly service is second to none. You can rely on us to have your milk with you first thing in a morning, ensuring your family and work staff can have that all important tea or coffee to set them up for the day. All of the products we provide are of the highest quality. Whether its traditional glass bottled milk, or plastic bottles, your milk is fresh, tasty and creamy as you would expect from your morning delivery. As we have been delivering for many years, we know how important it is to deliver without being heard. Quiet, respectful delivery is the order of the day with Knight Dairy. Imagine not running out of milk again. No trips to the corner shop, no getting the car out for a bottle of milk. Even payment has been brought into the 21st Century - No waiting in to pay, just ask about paying directly from your bank. Of course, if you wish to pay the traditional way, we can do that also. We have been trading from Sheffield and Rotherham for all of our 15 years. First of all Ecclesfield, before Brinsworth and now Swinton near Wath-Upon-Dearne. So you know we are only a small journey away. It is importatnt that whatever you do, being happy, smiley and friendly is essential, especially when you are dealing with the general public. This is even more so when the people you are serving are the people you live amongst. It doesnt matter if you only have a few bottles a week, or a large company that has a big weekly order, you can be sure that any interaction with us will be a friendly one. Living and trading from Rotherham, we feel we have a good idea what local people want. When we first started delivering to the public, we knew the main ingredients to making the customers happy would be a reliable, friendly and professional service that is convenient to the customer. This, mixed in with a high quality product at a fair price soon propelled the business into reaching more people and more areas. It wasn’t long before this recipe was taken into the commercial area of business and we started serving shops, schools, factories and other businesses. Traditional values have always been part of Knight Dairy and always will be. We sell a variety of Fresh Milk in Glass bottles or plastic poly bottles if prefered, All our milk is supplied by JACKSONS DAIRIES and is delivered Fresh daily. All our Bread is supplied Fresh every day from Coultons HAPPY BREAD and includes BAKESTONE Bread, Hetherton's and the very popular ROBERTS BREAD. "Our milk is always there first thing in the morning. We are never without milk for a cuppa." "We have had milk from Knight Dairy for 15 years and never had any problems with any part of their service." "We have milk, bread, cream, orange juice, milkshakes and many other products from Knight Dairy all of which are of the highest quality and we can always rely on them to deliver."